Note: Igor Karaev, better known as TSGIGOR to many on the Internet, was voted 2009’s “UGer of the Year” on MixedMartialArts.com for his incredible photos of, and access to, MMA legend Fedor Emelianenko. Special thanks to Nathan Johnson for providing his recent discussions with Igor. In February 2009, Igor Karaev began posting on “The UnderGround,” an Internet discussion forum dedicated primarily to the sport of Mixed Martial Arts . His first communication was met with a range of reactions, but much of it amounted to this: impatient and annoyed disbelief. After all, the man claimed to be a personal friend of Fedor Emelianenko, arguably the most dominant competitor in the history of the sport of MMA. Oops, I was one of those impulsive doubters. But it turns out that Igor is the real deal. And so, for the first time, fans of MMA have regular access to that living legend. Fedor. A man previously thought to be mostly inaccessible and tucked into some training bunker in distant Stary Oskol, Russia. Igor is a Russian speaker, and he has been largely dependent on the use of online translators when communicating to international fans. To some degree, that process has restricted his ability to express himself fully. But Igor and I share a mutual friend, Ilya Zakharov, an English-speaking Russian native who has been studying in Canada. Ilya has made a conversation with Igor possible, and I’m honored to have had the opportunity to receive an unhindered expression of Igor’s experience in the realm of MMA. I’ve heard it suggested that there is something superficial about Internet-based relationships, as the web coldly digitizes away the nostalgia of things like handwritten letters and rocking chair conversations. I get that modern anxiety, but my communications with Igor are making me rethink that sweeping reaction. The following is a discussion that we’ve had through Ilya over the last few months. Nathan: How long have you been involved with the sport of Mixed Martial Arts, or Russian Sambo? Igor: I started when I was 14. It was in Kiev (Ukraine) where I was going to school. However, I started in Judo, back in those days (70s) there was barely any difference between the two in competitions. Then came karate, followed by kung fu. It was quite “cool” and secretive. Getting into a karate dojo was very hard in those days. I was lucky. I was also lucky with the trainers. Most of what I learned in my youth in martial arts came in handy throughout my life. There were many different situations. I have served 2 years in the army and went on to study in the medical faculty of the University of Moscow. So academically – I’m a doctor. The studies were taking up a lot of time, but I kept going to the gym. It was a time when karate was forbidden in the USSR. The beginning of the Perestroika was around the same time as I was finishing my studies. All the bans on martial arts were lifted, but at that time I already had a family that needed to be fed. I had to move the sport aside and start working on a business. But I consistently kept in contact with the sport and most of my friends, who ended up being great athletes, not only in martial arts. It’s only the last five years that I’ve really dedicated myself to martial arts, as I have acquired some free time. I’m aware that in my 50 years of age it’s too late to come back to the ring, but I keep doing it to stay in shape. Nathan: Prior to the dawn of Perestroika, what were the consequences if the authorities discovered that you were training Martial Arts in the USSR? Nathan: The sport of Mixed Martial Arts is relatively young in America, and government bans have gradually been lifted. Do you remember what that transition was like for you, and how it affected people in your country? Igor: Honestly speaking, I didn’t notice an actual transition. The knowledge came about that the only way to succeed in martial arts was through hard work, that there’s not really any “secret moves” that somebody new to training could walk in and pick up in a week. We have a lot of different trainers giving lessons in a lot of different martial arts, where they offer to turn you into Superman on the streets in a very short period of time. Nathan: What do you believe is the key to supporting the continued development of Russian MMA? Igor: That’s a very serious question, a fundamental one you can say. There’s no governmental support for MMA in Russia. But there is a basic preparation in the form of serious Sambo, Judo and Boxing schools that have been available since the USSR times. Nathan: Have you personally done any training? Nathan: What is your relationship with Fedor Emelianenko, his brothers Aleks and Ivan, and the Red Devil team? Igor: I would like to start by saying that there are a lot of people that call Fedor a friend, when they may have only seen him once and took a picture that time, I would like to say the following: I respect those people. I know Fedor very well. I see Aleks quite frequently as well; he has a great family and a wonderful wife. Sasha (Aleksander Emelianenko) recently gave Olga a York terrier – my wife has the same tiny dog. Ivan is a young fighter; he’s already won a championship in St-Petersburg in combat Sambo. He’s practically everywhere with Aleks, always helping him out at competitions and gatherings (which is where I frequently see them). So we have a lot in common. Nathan: How long have you known Fedor, and were you able to observe him and his brothers as they began training and matured into their accomplished careers? Igor: I’ve known Fedor as a fighter for a very long time. As a friend and excellent comrade, for a bit over a year. 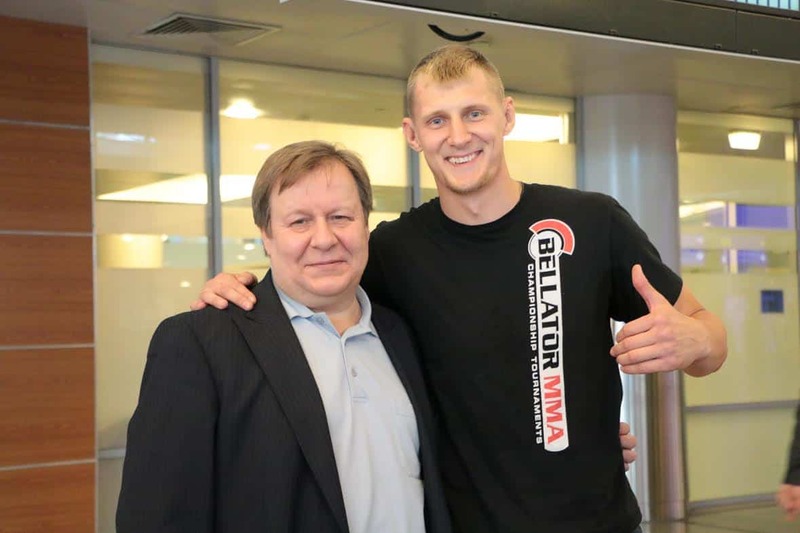 I brought over a young fighter from Moscow to the Red Devil team in Stary Oskol, Alexander Volkov. Once there, I met Fedor and got to know him personally. Since then, we commonly see each other, sometimes in Leningrad, sometimes in Oskol, sometimes in Moscow. The last time I went over to Stary Oskol, last summer, I was personally invited by Fedor to stay at his place. I had the privilege of seeing his life outside of his training. I must say that Fedor’s life is dedicated to one thing: the Path of the Warrior. He is a true Warrior-Fighter, beginning with his rest and ending with his relation with life and the environment around him. Nathan: Was Fedor’s success surprising to you? Igor: No, it was not surprising at all. I always get a certain pleasure from seeing him win. Those victories are always the result of a long, hard, and even harder road of preparation before the fights. Nathan: Why did you decide to become involved in posting messages on English-speaking Internet forums like MMA.tv? Igor: It was quite random. This is where I would like to express my greatest thanks to Mr. Kirik Jenness. I still remember my first post “O Stary Oskol”, which I translated through a computer translator and posted on the UG. The people on the forum were very harsh and rough. But they were also smart, and as time has shown, talented and grateful. In short right, I was pushed away from the get go. Mister Kirik stopped me and now we have what we have. I have a lot of information about my favorite combat art. And it’s in my character to give and share. But I wanted to give for a good cause. That cause happened to be there, in the UnderGround. There’s also a lot of very interesting information that helps me understand the global/world view of MMA and its development. Plus, on our side, there are really not that many Russian MMA sites, where the issues of the sport are being discussed. And the few that are there, mostly take all the information from the foreign sites, without ever giving anything back (outside of the rare exceptions). In short, I have taken up this role of popularizing MMA in Russia and USA, and thankfully there have been enough possibilities for that. Nathan: You’ve said that your time on the UnderGround has helped you to have a better understanding of the world’s view of MMA. Is there anything unique about the Russian approach to MMA and business that is important for international fans to understand? Igor: This combat sport is fairly young in Russia. Your foundation (the USA’s) gives us the possibility to possibly avoid the mistakes that have happened elsewhere in its evolution. I would like to hope so. I doubt that there’s anything unique, is it all big, hard work over a long time. Daily work, essentially, like elsewhere in the world. Nathan: Did you start communicating with international fans on your own, or were you prompted to do so by Fedor or by someone else? Igor: On my own, of course, I’m completely independent. I really like this; it’s for my heart and soul. If you pay attention you know that my information isn’t exclusively about Fedor, but also about a lot of other fighters from our corners that I know personally. I have always respected people that did their job well, people that have made themselves – that didn’t show up to something that was ready from daddy or mommy; mostly as a consequence of being around pretentious “geniuses” of business and arts. There are plenty of examples, on both sides of the world. Nathan: Do you post on any other American Internet forums? Igor: No, in the last while I have mainly focused on the UnderGround and the Russo-phone forum mixfight.ru. Although I browse several foreign sites, I rarely leave messages. Back in the day, I registered on several American sites. There are a lot of great sites on MMA overseas. For now, this forum is interesting to me. Nathan: Have you noticed any differences between fans in America and fans in Russia? Igor: There’s no difference, the age aside perhaps. In Russia, the higher limit of the bracket is younger, and extremely motivated. The styles of the arts are still very young here, as opposed to the states. There lies the difference. Nathan: Why do you believe young Russians are so motivated, and what sorts of exceptional habits do they have in training? Igor: For a lot of young guys it’s a means to make money for a living, doing something they love. There are different specific cases, but there’s a lot of them, and in each unique case, there’s a unique program. Nathan: Is there anything else that you would like to communicate to international fans of MMA? Igor: Peace in the world. I wanted to send my respects and bow to all of my friends, and everybody that loves and values MMA. Thank you all for your support and your love towards this type of combat sport. 1 The UnderGround can be found in the “Forum” section of MixedMartialArts.com and Igor’s more recent thread entitled “FEDOR !” can be found on the UG here.